Chicken Burrito Bowl, chipotle adobo chicken, black beans, rice, veggies all prepared in Instant Pot for quick weeknight meal. You will love the flavors. 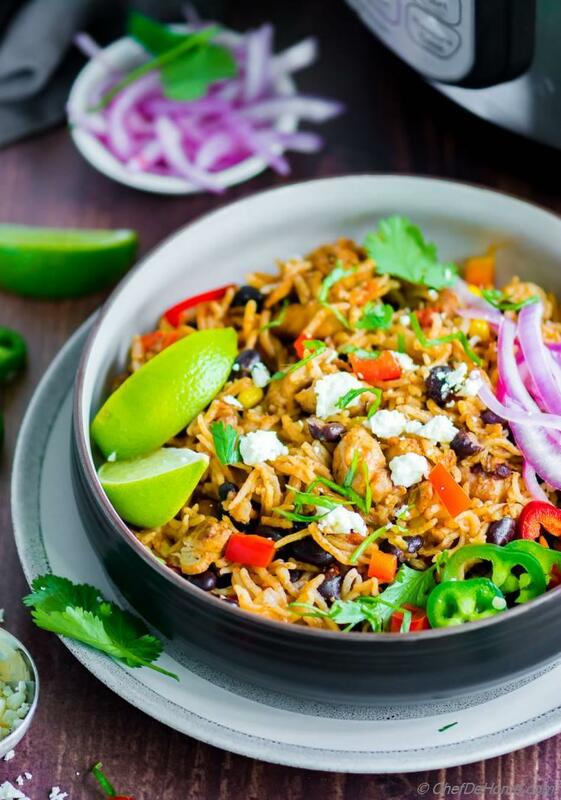 Chicken Burrito Bowl prepared in Instant Pot start to finish for a weeknight dinner ready in 25 minutes. It has all you want from a hearty yet quick weeknight meal. Delicious chipotle chicken, black beans, corn, bell pepper, rice, and spice. Gluten free, nuts free. Also dairy-free (when served without dairy toppings). Burrito Bowls are my favorite when it comes to early Meal Prep. Even though Instant Pot ready this hearty meal in 25 minutes starting with fresh chicken and raw rice.. Yet it is even better to spend those 25 minutes over the weekend and keep weeknight free. It keeps well in refrigerator for up-to 5 days. Freeze well for up-to 6 months. Honestly, weeknight dinner can't get easier than this. What do you say? Let's make Chicken and Rice Burrito Bowl?! Oh, and before we check the recipe, I highly recommend trying my 5 Minutes Magic Burrito Sauce to serve with this burrito bowls. 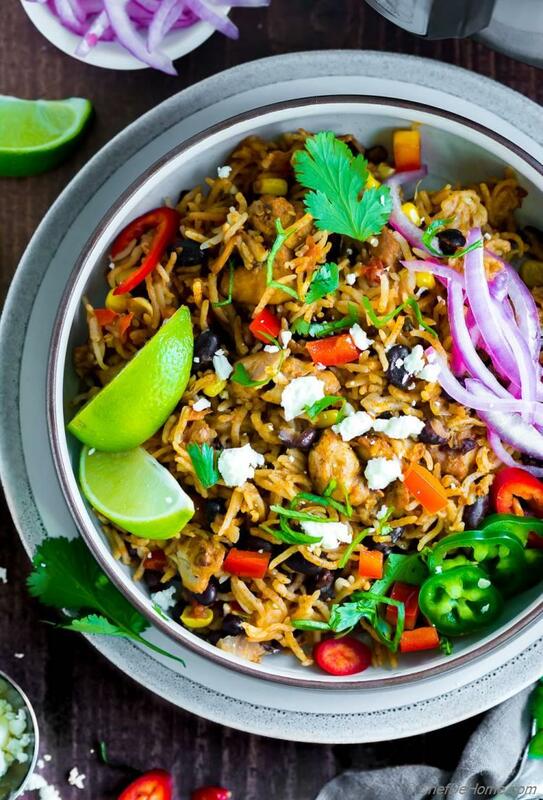 This Chicken Burrito Bowl recipe has rice and black beans which makes it a hearty complete meal. Still, it is low-carb than regular burrito because these is no extra tortilla. I find it filling and very satisfactory. No tortilla required. In my home, chicken and rice are everyone's favorite. You can tell from all the Chicken (or other protein) and Rice recipes on blog. Honestly, it is all about the comfort of one-pot meal. If I get chances to sneak-in some veggies.. that rice recipe is a winner! This is where Burrito Bowl outshines my other chicken-rice recipes. It has red bell pepper, corn, beans, veggie-full salsa. Plus the option to top with more veggies. That much and still family loves it. Life is peaceful. No ifs or buts, burrito bowls are everyone's favorite. You know, Vishal would carefully remove any tomatoes I add to rice dishes. Mostly from all chicken and rice dishes. But not from Chicken Burrito, ever! I call such recipes a keeper. 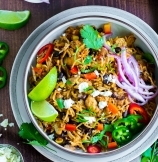 What makes this Chicken Burrito Bowl Recipe Special? 1) Flavor: Friends, the flavor of these chicken burrito is simply awesome. So tasty that it does not even need a lot of toppings. Some crunchy jalapenos, and some salsa. These tastes scrumptious even without cheese.. Seriously, I'm a fan! 2) Instant Pot: Another special here is the cooking method. 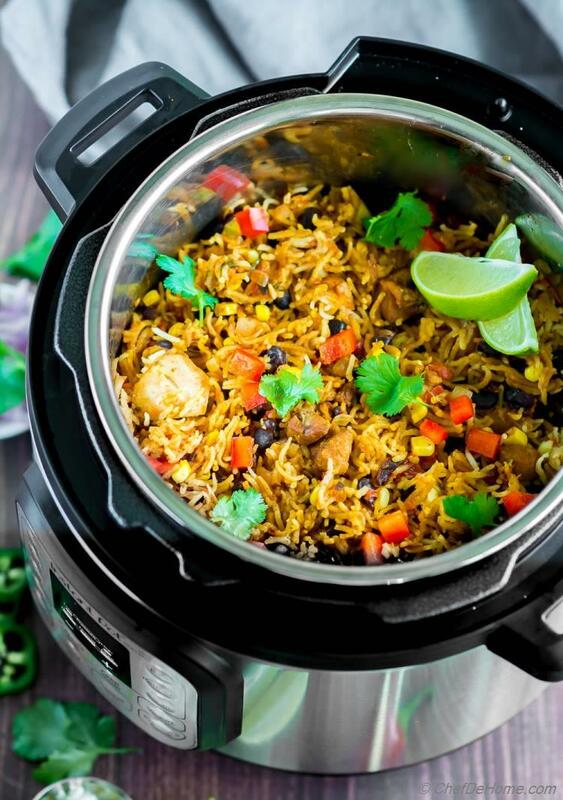 Our hot favorite Instant Pot. drum rolls! 20-25 minutes, actually only 15 minutes of cooking and you have kitchen smelling like Mexican Restaurant. Delish! I use pressure cooking setting of IP (details in direction) for this recipe. It works perfectly every time. a) I skip chicken when we are on vegetarian diet for a wholesome Veggie burrito Bowl. c) Recipe is dairy free. Only don't use any dairy toppings and your dairy-free family member is covered too. TIP: I like to slice a red onion and season with salt and lemon juice. Leave aside while Chicken and Rice cook in Instant Pot. In this time, onions get quick pickled, have less sharpness and more deliciousness. 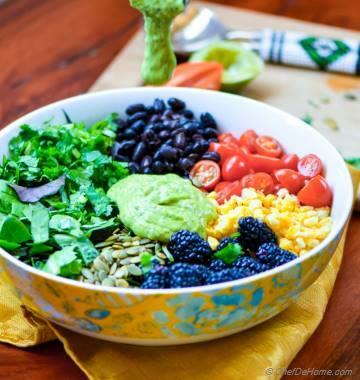 Top on burrito bowls before serving. A perfect replacement to tang of sour cream. I made these bowls for Meal Prep this weekend. So glad that covered for at-least two weekday meals. Total Time 25 minutes Prep Time 10 minutes Cook Time 15 minutes Difficulty Easy Yields 4-5 Cups Serves 3 Notes No. of servings depends on serving size. Smart Swap Replace white rice with brown rice or quinoa for more fiber. 2. Add in minced chipotle and sauce, diced bell pepper and cumin. Saute for 30 seconds. 3. Add in diced chicken with generous pinch of salt. Saute with mixture for 30 seconds - to a minute or until chicken is not pink from outside. You don't need to fully cook the chicken or it will be dry by the time rice cook. 4. Add in drained black beans, corn, salsa, and stir to combine. Add washed rice. Top with 1 cup chicken broth. Stir to combine. Set Instant Pot to cook on Manual - High Pressure - 5 minutes. When ***cooking time is over and beep sounds. Quick release the pressure. 5. Leave covered until ready to serve. When serving, gently mix everything, ladle into bowls. Top with chopped cilantro, sour cream, sliced avocado, and more salsa. Serve and enjoy! **1 chipotle chili and about a tsp of adobo sauce makes a tbsp. No or less than tbsp mild, 1 - 1.5 tbsp - medium, 2 or more tbsp - hot. You can also use Mexican chili powder. ***I used long grain basmati rice. 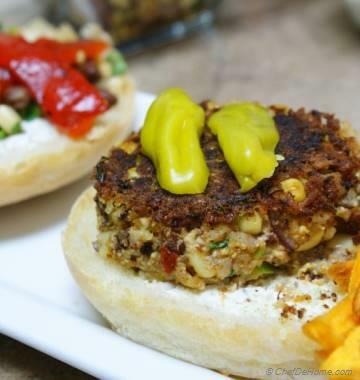 These cook perfect with QR in 5 minutes. If you using short grain or brown rice, time and liquid quantity will be different. Let me know the kind you using, and I can help. Use ready-to-use medium salsa. Or blend 8 ounce can of crushed tomatoes, 1/2 jalapeno, 1/2 red onion, 4 tbsp. cilantro leaves with juice of 1 lime. Season with salt and pepper. Leftovers stay good for 3-4 days. 1. 1 Cup Brown Rice will need 1 and 1/4 cup of chicken stock/broth. Use chicken as-is (not-diced) and shred later. If you prefer little sturdy veggies (I mean bell pepper and corn only, or what you using), mix-in veggies later. After finishing cooking, add veggies, mix. Cover the lid (off instant pot) for 5 minutes for just lite tender veggies than mushy. Hi, I want to try this recipe but I have chipotle powder and adobo powder not chipotle chili and adobo sauce. Could I substitute that with the powders? Thanks! Hi Nikita, I have only used chipotle adobo sauce, never powders for this recipe. I think chipotle powder should be fine but I’m not sure of adobo powder. Never came across dried adobe. Hi Savita I ran across your recipe and it sounds great. Going to make this burrito bowl tonight. Thank you! Hi Pava, thanks for letting me know. Happy cooking! This was delicious! I left out the corn (only because I can't eat it) and used brown rice. Rice didn't get completely done, but I will adjust time slightly when I make it again. Thanks, Savita! Thanks for feedback, Barbara. I'm glad you enjoyed. Thanks for the recipe, but it took two pages to print out and left a huge blank space between ingredients and directions on the first page. It would easily have fit on just one page. Why all the blank space???? Barbara, thanks for bringing this to my notice. I'm not sure why there was a blank space but I'll get it fixed asap! I regret the inconvenience it caused. Update: It is fixed. Let me know if you ever see space again. Thanks once again. Could this be made in a regular pressure cooker ( not Instapot)? I dont own an Instapot but do a lot of my Indian cooking in a pressure cooker. Yum! Can this be done with steak instead of chicken??? Steak or red meat (like I use lamb) takes longer to cook. If use brown rice (instructions in notes) and steak. It will be perfect because brown rice also take longer to cook. Only slice meat small rather than keeping whole. (this advise is based on assumption well done red meat.) If using white rice like recipe suggests (or quinoa), I recommend cooking meat little longer before adding rice. I hope it helps. Hi! This looks amazing, if I were to swap the basmati to brown rice, what would the cook time be? Thank you for the recipe! Hi Mimi, I updated instructions to use brown rice in notes above. I've been asked this question frequently. So, in notes it shows formatted, and more easily readable than here in comments. It is just below the recipe card. Please take a look. I hope it helps. 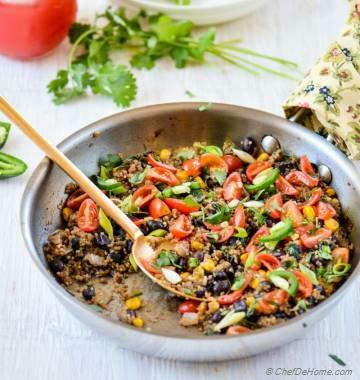 Do you have instructions for making this with quinoa? This looks so YUM!!! Hi Kelly, this recipe can be easily used with quinoa. However, I have not tried it with quinoa myself. I have a new recipe (different recipe) in-test which uses quinoa. I'll certainly update the Notes once I have right proportion of water and time to share. This looks so vibrant and colorful! Its hard to get my two-year-old to eat his veggies, but he loves his chicken and rice so this might be a winner with him! More than tasty....this is beautiful! I'm always so amazed and pleased at how everything from an instant pot looks fabulous. Love my IP. I agree, Instant Pot is an amazing tool. Isn't it?! I'm glad you like my take. thanks. This makes wish I had an instant pot! 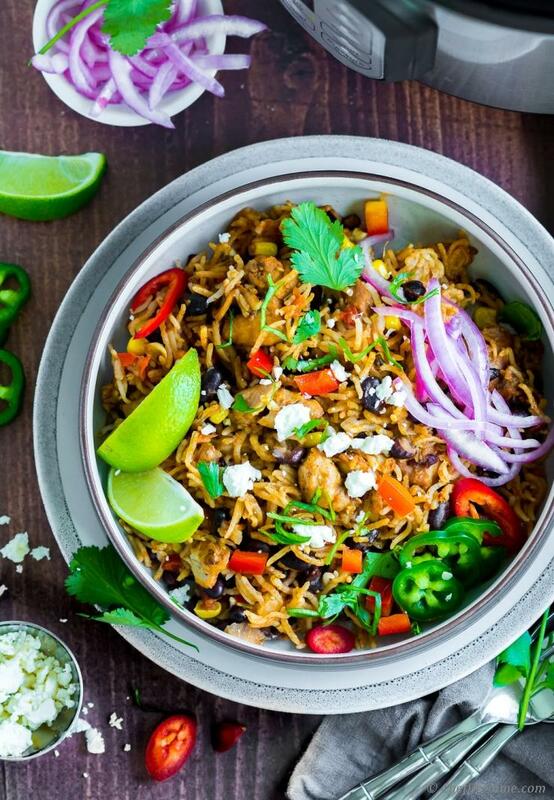 I looove chicken burrito bowls and this recipe sounds amazing! How sweet Marie. Actually, you can also make these burrito bowls in regular dutch oven. Just time and liquid will vary. I'm obsessed with my instant pot lately! Can't wait to try out this recipe soon- just pinned to it my instant pot board! Thanks for Pin Emily. Our love for IP is certainly mutual. Thats so yummy looking! We are having chicken and rice for dinner, so this is totally my cup of tea! Thanks Katie for sweet words. Chicken and rice make perfect meal in my family. I hope you too get chance to try'em soon.